“Therefore encourage one another and build one another up, just as you are doing.” 1 Thess. 5:11; ESV. Play dates are awkward because of our children. We see everything differently. Our way of mothering, of thinking about things has suddenly moved oceans apart. We are divided in every way. Food, screen time, nap time, and school time. We even approached the birthing process as complete opposites. How could it happen to BFF’s (best friends forever) in complete sync BK (before kids) to now differ so greatly AB (after babies)? Well, moms, I’m here to tell you it happens. I’m also not going to promise your friendships will survive or be as they once were, but I can give you hope that parents whose styles come from different planets, often end up with wonderful children in spite of different methods. I predict the polar span will likely dissipate as your children grow. Change the focus. You are both working towards growing responsible children able to someday live and thrive on their own. Whether or not you go organic, do time-outs, charts, or bribe with carrots or candy, focusing on the urgent can keep you near-sighted. Give your attention to a bigger picture. If any method runs contrary to God’s Word draw a solid line, but preferences don’t need to kill a friendship. Lighten expectations. Raising children is not a competition. It’s not a race. It’s not a “my kid’s better than your kid” contest. The pressure of comparison amplifies criticism. An instruction manual didn’t hang from the umbilical cord. All mothers are trying to make their way, figure it out, do the right thing the right way. Learn from her. Just ouch. Believe it or not, she will have some insights from which you can glean. If you approach motherhood as learners together, it can help tensions melt. You know your child better than anyone else. She knows hers better than you do. Seek to be an encourager. Look for what she does well and mention it. A mom’s tanks deplete easily. Pull back your disapproval lens. Be intentional in finding what you can praise. Re-establish connection. Go out together without kids and try to talk about anything but baby food and temper tantrums. There is still a person inside each of you that doesn’t get out of the mom role much. Find her and reconnect. A marvelous thing about mothering is an expanding bond with others in the same boat. Women who don’t know Jesus are often soft to the gospel because their role has brought a new dimension of need and vulnerability. 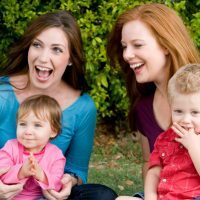 Believing friends find themselves in the same boat, eager to be encouraged and nurtured in how to be the best mom for Jesus and their children. Each one needs encouragement. The next time you and your friend meet with your little angels, you might remember this as well: It’s going to take a whole lot of prayer. Enjoyed. Well past child-raising age, my interactions are generally limited to once a month when I assist with Children’s Church. Child rearing these days is very different from when I dealt with little guys on a regular basis. I’ve decided; it’s not for me to tell parents how they should bring up their children. My job is to be the example to them to learn from when I interact with their children. Thanks for the comment Jim. I do think the conversation needs an invitation. Example coupled with your experience is I’m sure appreciated and a blessing in ministry with Children’s Church! Raising children is not a competition. Ouch, when my three children were growing up I too often gained my self-worth through their achievements. At 65 years old I can admit that. Your words are timely wisdom for all.